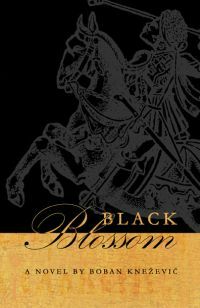 "Black Blossom" is a genuinely magical story with the timeless qualities of legends and fairytales. In my mind, "Black Blossom" is the only book I know that accurately and seamlessly integrates traditional and modern genres of completely different storytelling techniques. The result is sharp and touching, a Jungian drama with long-term echoes. Boban Knezevic’s novel Black Blossom reaches us from the endlessness of fantasy and stops at the crossroads between genre literature and so-called “great” literature, surviving in both long-ago divided worlds in which the genre is equaled to para-literature and a priori “inferior” to literary mainstream. Not until the post-modernistic idea was this scheme altered, but it did not succeed, due to great effort, to dismiss it. Thus Black Blossom can be read both from the point of view of genre, namely fantasy (epic fantasy), as one of the “new fairytales”, but also as a work leaning upon Frei’s statement that “literature is reconstructed mythology”, therefore upon the ideas of mythological and archetypal backgrounds. Knezevic’s world is built upon the foundations of the mythological recollections of the Serbian people in which, in deeper layers, archetypes of heroes and situations singular to all civilizations can be found. The remnants of Dushan’s great empire, where the plot of the novel is set, are known as a historical fact, but there is also a Dushan’s empire from folk oral tradition that does not coincide with the previously mentioned, because they both exist in different worlds. On the level of general archetype we can easily recognize the situation of great glories reached by the strength and wisdom of mythological fathers-Messiahs. The roots of other occurrences in the book are similar as well – from the camp where heroes prepare for destiny-making deeds, battles with heroes (in the Serbian version this is the duel with the Black Arab), through characters such as a strict father, a master blacksmith that forges the weapon of justice, faithful servants, wise men and witches, evil-boding birds, to the episode of the girl sacrificed to a dragon, as one of the oldest archetypal tales. Into a thus divided frame Knezevic builds versifications, new solutions, he reconstructs ancient tales. His hero is not a superior prince, but someone who owes his strength to the opening of a new curse that was “earned” by the swaggering of that celebrated founder of the empire, for whom it is said that he was strict, but just. The warrior-sorcerer, the prince’s opponent, appears in Knezevic’s novel as the avenger of victims (once again an archetype), and the prince is the one who must break the curse by returning the avenger (therefore, Justice) into chains, by which he will ultimately redeem neither himself nor his people. Victory becomes partial and bitter, and the prince’s sacrifice will bring him, instead of glory, long years of inense weakness and regret, traumas that are the consequence of breaking socially imposed mechanisms of resistance, which Devero defines as “ethnic unconscious” and differentiates from “general unconscious”. Let us point out as well that Knezevic’s world does not contain only elements of folk tales, but also mythological elements created by his predecessors-authors, confirming once more the above-mentioned statement by Frei. The language in which this tale is narrated, full of archaic words and formulations, determines the conditional (consented to by the reader) “age” and therefore the truthfulness of the story. Still, Knezevic abandons linear narration, which would be in accordance with oral folk tradition, and decides to begin the novel with the central episode in which the secret of the fate of the warrior-sorcerer and prince is disclosed, and to lead two parallel plots from there, one towards the end, and the other towards the beginning of the tale. Such a decision, akin to post-modernistic plays with form, proves to be extremely useful both for the maintaining of suspense (which is necessary when you bear in mind the fact that the end of every fairytale is, in essence, already predetermined), and for setting the psychological nuances of the prince, by comparing the states he was in before he learnt of his destiny – to those that he goes through while progressing towards the fulfillment of his quest. The episodes take place in the same locations but at different times, the time of departure and of return, and they are set according to the principle of conflict of light-good-spring-order and dark-evil-autumn-chaos, therefore, the basic principles both of mythology and of the fantasy genre. Boban Knezevic’s novel stems from dual experience, one the nature of the genre, which consists in the search for a tale, and the other the mosaic, lexicon experience of the reader of today. Knezevic’s first experience is the learning of fantasy, myths, fairytales, epic narration, from which he draws his authentic “narration gene”. As an “author from the outskirts” (these outskirts are related to his years of dealing with science fiction and, in general, pure genre), aside from the leading literary cannons, fashions, stylistic formations etc., he bears within him the seed of a new and diverse grasping of fantasy in the traditional key. by which he negates and outgrows this phenomenon to which he seemingly belongs. Knezevic’s second experience is the experience of the reader of today (and at the same time the experience of a writer) by which the linear tale of classical narration is turned into a mosaic, spiral tale, retaining, still, the insight that narration is native to man’s verbal expression and the handing down of transmitting of knowledge. Thus Knezevic’s novel appears in Serbian prose on the wave of the return of plots, unhindered by the literary conventions of construction, deconstruction and the like. Plots, in a pure genre sense, the way that they are used in crime or science fiction, a rigid structure that respects the linear genetic predispositions of the reader, who lives in the course of time, no matter how this time is portrayed. Thus, the standard model of maintaining suspense in genre prose is the physical discontinuity of the course of the plot. What Boban Knezevic introduced as his personal method of maintaining suspense, which must accompany a plot comprehended in this sense, is the temporal discontinuity of the story. This novel starts from the middle, and then forks towards the beginning and the end. Naturally, such a temporal course would be but a mechanical idea of the author were it not literarily convincing through a cyclic text, which portrays the cyclic comprehension of time in the novel Black Blossom. The tale itself tells of a curse that has befallen the hero’s people, the Serbian people of course. The curse is fought by the hero of this novel, a hero that has the characteristics of the epic heroes of Serbian literature, in the areas that stem from collective oral tradition, folk tales. This novel of a curse, embodied in an evil that is destroying the Serbian people, and which cannot be destroyed, for it has the formula of a double, flows through familiar localities, temptations and metamorphoses of the hero, who, because of his own desire for glory, awakens true evil, but also (temporarily) destroys it, overcoming his vanity, until some future time and new hero, once more full of doubt in himself and the desire to outgrow his destiny. And as upon a fresco that would portray the entire world upon its surface, on the pages of this book we encounter such heroes as Kraljevic Marko and Baš Celik, the Turks and the Serbs, witches and enchanted forests, Turkish inns and Serbian rulers, as well as genre standards such as evil in deep corridors below castles, selling of the soul for worldly glory, Conan-like ruthlessness and carnality of the hero, etc. Before the novel Black Blossom, I knew Boban Knezevic (Belgrade, 1959) as a publisher and editor, simply as a man who performs the many tasks related to the printing of books and magazines. Knezevic mostly wrote and published science fiction and epic fantasy and the signs of this interest of his strongly mark this author’s first novel. The novel Black Blossom brings to life the motives of our epic abundance. The epic line of Serbian folk literature is coupled with a significant part of the fairytale world of the same tradition. Certain sentences, or even entire passages from the Black Blossom, are almost complete paraphrases of epic verses and situations, or a replica of the fairytale sphere, and these paraphrases are for the most part very functional, because they are unavoidable elements of an interesting intertextual web. Thus, both in the characters and in the typical situations of Knezevic’s novel, we can recognize the characters and circumstances that are the starting figures of our elementary knowledge of the world of epic poetry and fairytales. Returning us in quite a skillful way to this world, Knezevic not only creates a new construction from this world through his narration, but also discloses taboos characteristic for the epic and fairytale environment. The taboos will prove to be a constructive segment of the carefully built plot. The disclosing of secrets fulfills the hero’s destiny. Starting from such a perspective, this author develops the tale in several directions that are integrated around the tragic vision in which the destiny of the entire people and their main hero are fulfilled in relatively true cyclic intervals. In this hero we can recognize Marko Kraljevic, which is very interesting for the context of which I am speaking. Kraljevic, Boban Knezevic’s hero, will, against all expectations, turn from a weakling into a great hero the moment when destiny hands him the role of “signing a contract” with a warrior-sorcerer who constantly comes back to life and returns all the more terrible and evil. The warrior-sorcerer is, in fact, a curse thrown upon the Serbian people because of their sins, and Knezevic’s hero, disclosing taboos and reaching to the very bottom of national oral heritage, can fulfill his destiny only by neutralizing its stigma – the warrior-sorcerer. The complexity of the situation in which the hero and narrator of Knezevic’s novel found himself is enhanced by the fact that he received his strength from the warrior-sorcerer and that – by classical epic key – he can conquer the warrior-sorcerer only if he returns his strength to its source. Knezevic’s hero conquers more himself than the warrior-sorcerer, because this is the only way for him to be at peace with himself, and the narrator sees peace with himself in the breaking of the “contract” with the curse and doing for the greater good: “I once sold out my own people for my own good. God will probably not forgive me for this, but if I do it again, none will forgive me”. The sense of sacrifice, so close to the epic sensibility, appears therefore as one of the more important semantic markings of Knezevic’s epic fantasy. In that sense, we should also mention the specific epic vitalism, building personal acts into the collective picture of the people or mythological layer as initiator of individual gestures, but also the use of stereotype numbers and typical epic formulae on a formal level. Knezevic is even willing to take over some elements from the epic lingual register, although a lot more could have been done in that field.